This recipe was emailed to me from a colleague at work. This past long weekend I went to my parents place in BC to spend some time with my mom putting together the centerpieces and ceremony isle planter pots. Other than getting a nasty sunburn, it went really well and was low cost too! We had gathered the centerpiece pots and painted them a while back and had some excellent soil that we had been given a while ago which was fantastic. My mom graciously bought some miracle grow as well as the flowers (approx $175) and we had bought some large planter pots from Walmart (approx $30) as well. All told the total cost was just over $200 for our centerpieces (25) and isle flowers (12). Last week I spent some time getting my planter pots ready. Instead of buying new hanging baskets for $30/each - I spent about $20 on flowers and used my baskets from last year. I have flowers left over that still need to get in the garden. Aries decided to get in the dirt and help me!! A couple of weeks ago when I was in my hometown my family and friends threw me a wedding shower. Hosted at my aunts place I was spoiled with gifts and goodies after playing some super fun, super rediculous shower games! Then they took me out on the town (to all five bars) - it was a pretty fabulous night. The theme of the gifts was time of day - so depending on the time of day the person got was what the gift was based on - it was really fun!! I can't share pictures from the night on the town because my face is all over them, but the next day we went and visited our venue - here's a pretty picture of the field we're going to be getting married in. 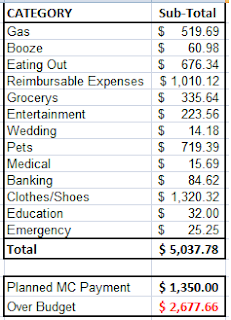 It seems that most of what I've been writing about lately are just checking in posts with where our spending is at, and it's usually not in a good place these days. We are actually doing somethings right - so I'm going to try to start sharing some of that too. I spent about $5 at Walmart for heavy duty thread and a needle and spent a couple of hours patching the four armrests - was actually pretty pleased that they all worked out! 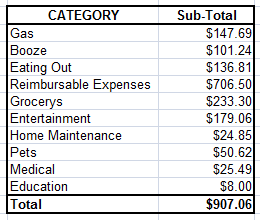 The total is the sum of all of the spending so far less the reimbursable expenses which I should get paid for on my last pay this month. 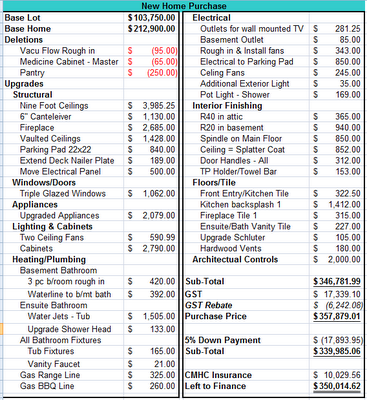 Typically our budget is for spending at about $1,350/month but we're trying to get it down to about $1,000 so that we can put that $350 to better use. 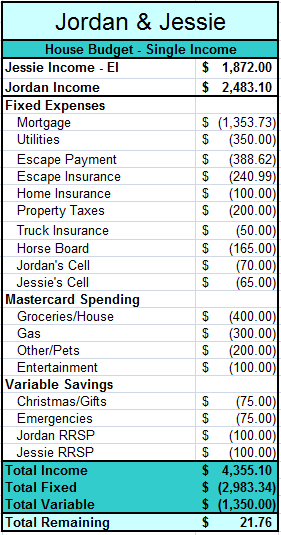 If we want to do that for May, we need to spend less than $100 2.5 weeks - I'm not so sure we can do it with a trip to my hometown coming up for the May long weekend. Proven Expertise - HR professionals who pursue the CHRP must meet all requirements set out by their provincial HR associations, which aim to measure their competence and experience as HR professionals. By pursuing the CHRP designation, you’ll prove your ability to tackle all aspects of HR and demonstrate to employers and colleagues alike that you are a true HR expert. Click hereto learn more about the steps to obtain your CHRP designation. Demonstrated Commitment – CHRPs must undergo rigorous studies, comprehensive exam(s) and ongoing learning. They are, in short, committed to the profession over the long-term. By pursuing your CHRP, you demonstrate your commitment to constantly updating your HR skills and highlighting your long-term passion for the profession. You join the class of HR professionals that employers seek out. Knowledge Community – As a CHRP, you are part of an exclusive, nationwide community of HR experts. Through special events, conferences, publications and websites, you can connect with other HR professionals from across Canada. This powerful network proves invaluable as HR professionals look for solutions, ideas and the ability to connect with others in the field. Ethical Behaviour – CHRPs commit themselves to high standards of ethical behaviour. They are held to the CCHRA National Code of Ethics that covers a range of important professional issues including confidentiality, conflict of interest, professional growth and more. You gain confidence from your employer, colleagues and peers with the knowledge that you are committed to a Code of Ethics that demands the highest standards for the profession. Once I pass the first exam (NKE - national knowledge exam), I will formally be a CHRP candidate. I'm excited to get my grades back....it will take 6-8 weeks! Quite a few people have asked if we have a plan in case one or both of us loses a job and/or I get pregnant – totally valid concerns. Jordan and I have talked a bit about this and I’m happy to share that our conversation with you. The first thing to recognize is that we are in very different industries and the likelihood that we would lose our jobs at the same time is highly unlikely. He is a Parts Supervisor currently in his second year (of three) of his apprentiship which will culmination with a red seal designation. I’m a Human Resources professional currently pursuing my CHRP. I mention our education only to explain that we are not stagnant in our careers – we are both continuing our education and presence in our respective industries. Though we are both in the first five years of our careers we also both made it through the recession and came out strong – we both received raises in a time where people were losing their jobs. I say this to explain that we are both highly valued where we work. Most of the newer communities in Calgary are developed using architectural guidelines, or what used to be referred to as architectural controls. These guidelines set the stage for a community development by describing the overall vision or look of a community and the homes within the community. After the broad brushstroke of a community theme or vision is applied, very specific standards and criteria is set out by the developer to ensure the community’s appearance is a picture perfect portrait of the vision (http://www.newhomelivingonline.com/calgary/articles/2193/architectural-guidelines). Gas was very high however we made two trips to my hometown as well as several trips out to our new home and the Airport - plus with gas prices on the rise, I'm not really surprised by this number even though it is the most we have spent on gas in nine months! I'm hoping you are all proud of Jordan and I for the 'booze' category! This is the LEAST amount we've spent on alcohol in nine months! Eating out...is well, is anyone surprised? This is the worst month in nine months...I hate when we're trying so hard and wind up failing. The Reimbursable's are for my trip to Toronto, Saskatoon will be on the next month. Groceries is average and entertainment is a bit high (we went out to the movies a few times with friends). Pets is astronomical....we had a horrible couple of weeks with our dog. She ate our $200 fish tank filtration system, several library books, chocolate, two pairs of shoes ect. We unfortunately spent a lot of money replacing things she destroyed, buying her new/better distraction toys as well as an electronic collar so we can work on training her better. Needless to say, she's being kenneled again during the day. Medical was just a couple runs to shoppers drug mart for prescriptions and banking was INTEREST! yea... I know...I'll do a credit card update later this week...I'm ignoring it right now. Clothes..... so, you know I'm getting married? Well, I bought some getting married attire for Vegas. Jordan's mom was in the hospital for a day this month, so the emergency was parking/lunch for him while he spent the day with her. There it is, the raw numbers....questions/comments? It took what seemed like forever, but last week all of the wish list items that Jordan and I had requested a price for came back. It was pretty intense to look at all those numbers, and that's coming from a numbers person! 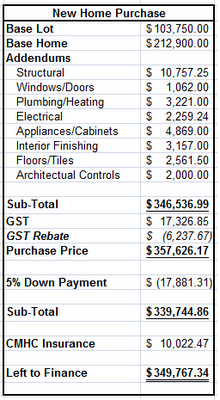 If we had elected for alllll of the items we wanted - the final number would have been around $375,500! It was fun for about five minutes to fantasize building the home that had every last detail finished - but then we got to the core of it. 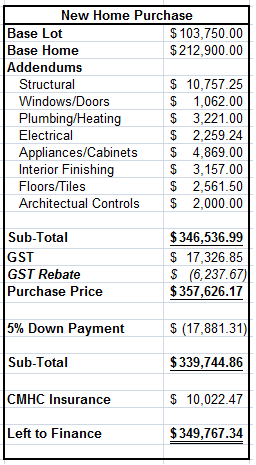 At the end of the day we both wanted to come in under $350K, and we've done it! 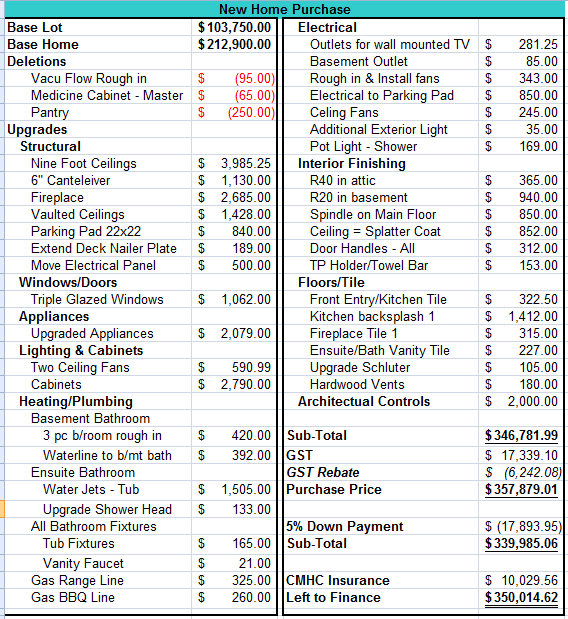 If anyone is a keener and wants to know the options that we wound up with, just let me know and I can get into more details. We have one more appointment before everything is done. In about 2-3 weeks we'll sign off on the final blueprints and the architectural conrols number will be finalized. I'm in Saskatoon this Thursday & Friday!